FILE - Pakistan's Prime Minister Imran Khan speaks during a news conference in Ankara, Turkey, Jan. 4, 2019. The Afghan government formally protested controversial remarks attributed to the leader of Pakistan, suggesting an interim "neutral" political setup in Kabul could help further U.S.-led efforts to strike a peace deal with the Taliban. Afghan Foreign Ministry spokesman Sibghatullah Ahmadi said Tuesday the neighboring country's deputy ambassador in Kabul was summoned to express "grave objection" over Pakistani Prime Minister Imran Khan's "reckless and "irresponsible" remarks. Ahmadi said the government "deemed such statements an obvious example of Pakistan's interventional policy and disrespect to the national sovereignty and determination of the people of Afghanistan." Kabul has long accused Islamabad of sheltering and covertly supporting Taliban insurgents, charges Pakistan rejects. "The Afghan peace process can only be successful if there is a neutral interim government, which can hold free and transparent elections to be participated by all the stakeholders," the Express Tribune Pakistani newspaper Tuesday quoted Khan as telling a group of journalists in his office. ​Khan made similar remarks a week ago when he said that peace was coming to Afghanistan very soon and "a good government" would be in place there to allow "our Afghan brothers" to live in peace. Those comments also had provoked Kabul to summon the Pakistani ambassador and register a strong protest, calling them interference in internal Afghan affairs. Islamabad takes credit for arranging the ongoing dialogue between the United States and the Taliban to help end the deadly war in Afghanistan. The dialogue meetings are mostly being hosted by Qatar and both sides concluded a preliminary draft agreement in their latest round of 16 days of talks that ended on March 12. Chief U.S. negotiator Zalmay Khalilzad, however, made clear that a final agreement would be linked to a comprehensive Taliban cease-fire and an intra-Afghan dialogue involving insurgents as well as Afghan government representatives. FILE - U.S. Ambassador John Bass attends a news conference in Ankara, Turkey, Oct. 11, 2017. “While Pakistan has made constructive contributions on the Afghan peace process, PM Khan's comments did not,” Khalilzad tweeted. The U.S. envoy emphasized that it is for Afghans only to decide the future their country. “The role of the international community is to encourage Afghans to come together so they can do so,” he added. 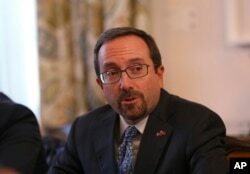 U.S. ambassador to Kabul, John Bass, also attempted Tuesday to dismiss suggestions Washington is discussing with insurgents issues related to future political governance and the current Afghan constitution. Bass told reporters the recently concluded meetings with Taliban representatives in Qatar have been confined to the fate of an American troop drawdown and U.S. concerns about the prospect of Afghanistan again becoming a safe haven for international terrorism. "We're not talking to the Taliban about interim governments, we're not talking to the Taliban about issues related to the current Afghan constitution and the current structure of government," Bass said. The U.S. diplomat stressed these issues are for Afghans and representatives of the government to discuss with the Taliban once an inter-Afghan dialogue is under way. "Our goal is to help produce a settlement that preserves the gains of the last 17 years, but those are not issues that we can decide and seek to impose on wider Afghan society," Bass said. The U.S.-Taliban peace talks have excluded Afghan President Ashraf Ghani's government because the insurgent group is strongly opposed to engaging in any talks with Kabul. The move has upset Afghan officials from the outset. Ghani's national security adviser, Hamadullah Mohib, launched blistering public attacks on Khalilzad earlier this month for allegedly sidelining the government and giving the Taliban legitimacy. FILE - Special Representative for Afghanistan Reconciliation Zalmay Khalilzad speaks at the U.S. Institute of Peace in Washington, Feb. 8, 2019. Mohib, while speaking to reporters during a visit to Washington, accused the Afghan-born U.S. diplomat of trying to create "a caretaker government [in Afghanistan] of which he would then become viceroy," a title used for the colonial administrator of British-ruled India. 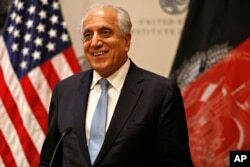 U.S. ambassador Bass attempted Tuesday to address those concerns and strongly defended Khalilzad. "I would just note, again, that Ambassador Khalilzad is executing policy and directives from the President of the United States and the Secretary of State as professional diplomats do when they're in the service of their governments," the U.S. diplomat noted. Mohib's comments outraged the Trump administration and he was quickly "summoned" to the State Department to be told that "attacks on Ambassador Khalilzad are attacks on the department and only serve to hinder the bilateral relationship and the peace process." Washington also reportedly conveyed to President Ghani that his national security adviser would no longer be welcomed in the United States and that American officials would no longer do business with Mohib. Afghan media has reported U.S. officials left a meeting of NATO ambassadors at Kabul's presidential palace on Monday when they noticed that Mohib was also in attendance. But neither Afghan nor American officials commented on the reports.